You know it's Autumn when you start baking everything which includes ginger and spices! I have been craving gingerbread/ginger cake since mid summer and it's definitely one of my top 5 favourite cakes/breads too eat! Who doesn't lover ginger, honestly?! 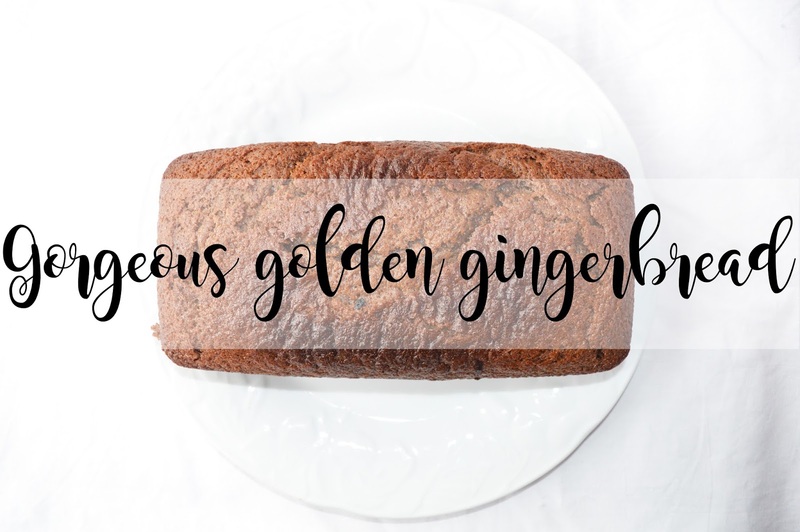 So, 23 days ago I made this gorgeous golden gingerbread which was probably the most easiest gingerbread I have ever made in my life, it's full of spices and gingerness and it just takes blimming amazing! (Yes I schedule my posts very very early). Perks of being a student and having no time! I absolutely love this gingerbread because it is so incredibly soft, it melts in your mouth, it's gorgeous hot and cold. Plus, I can imagine it being quite amazing with either normal custard or chocolate custard too. I am now craving this so much. Unfortunately, I did run out of ginger so, I end up using mixed spices which was a bit of everything! To be honest, I think it tasted so much better having the different spices in it, because you can really taste every single spice after every bite you take. It'a amazing! I love it and I hope you love it too. Melt the butter and golden syrup together, leave to cool. Mix together all of the dry ingredients and then mix in the milk and egg until it is smooth. Throw in your butter and golden syrup mixture, mix again until it is all combined and smooth. Pour into your lined loaf tin and bake for 30-35 minutes or until a cocktail stick comes out clean. Leave to cool slightly and then transfer onto a wire rack to cool completely. Let me know what your favourite cake is to bake in Autumn! This looks like a gorgeous recipe! I'm collecting loads of recipes at the moment and this is one that I'm excited to try out! Love an Autumn bake! Oh my gosh that looks amazing! It's making me feel warm and Autumny already. I will need to give this recipe a go!